Happy Easter! Happy Passover! Here’s hoping for a Happy Keith tonight, too. These are some good scores heading into Final. Will our champ be able to pull out the come-from-behind victory again? Let’s get to it, because this is a fun one. Remember, we save the dollar changes until the end. If Eric doubles his score, he’ll have 29,600. 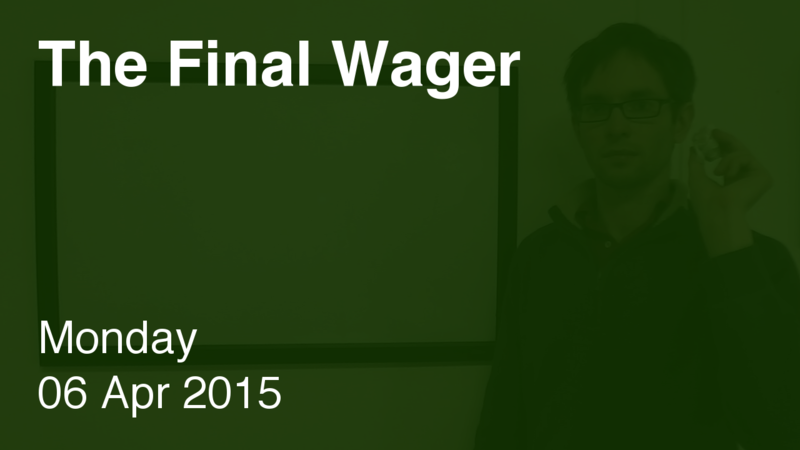 To cover this all-in wager, Brian will need to wager 10,800. An incorrect response with that wager will leave Brian with 8,000. To stay above his total, Eric can wager up to 6,800. Kerry can wager up to 3,800. A successful doubling will put Kerry at 23,600. To cover this, Eric should wager at least 8,800. In this case, though, he will lose to Brian on an incorrect response, so he might as well wager everything. If Eric makes the rational maximum wager of 6,800, Brian will need to wager 2,800 to cover him. We’ll ignore that, though, given it would allow both Eric and Kerry to pass him. Kerry could pass that wager from Eric by wagering at least 9,800 (read: everything). Eric could cover Kerry’s maximum wager by putting up 800. Brian‘s 3,200 wager makes no sense here. After this, we add a dollar to the minimum wagers, and subtract a dollar from the maximum wagers. In many situations, I’d give Kerry’s wager a red. Eric, however, has some wagers that could keep her (mostly) at bay – but note that my preferred range for Kerry would cover a zero/incorrect response from Eric. Eric almost left $5,999 on the table. He finished in third anyway. Brian’s wager was fine – technically, he could have gone for $799 or $800 more – but with so many moving parts below him, I’d recommend sticking to the bare minimum. What is the Chrysler Building?